OCCC students, faculty and adjunct wait outside after being evacuated from campus buildings during OCCC’s simulated bomb drill Tuesday, July 13. 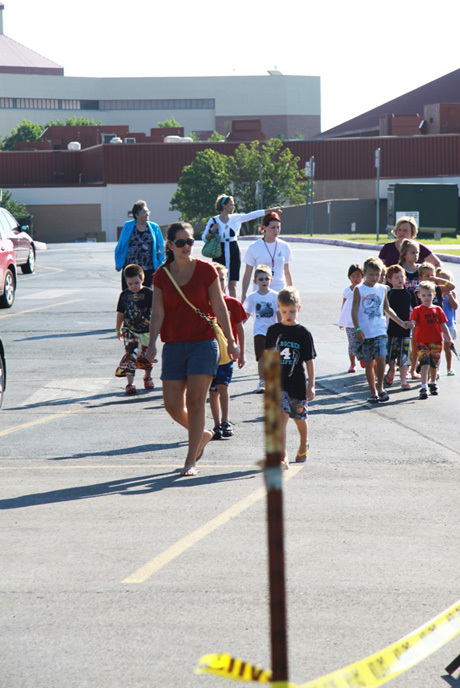 OCCC adjuncts and faculty evacuate Summer Sports Camp children from the OCCC campus during the college’s simulated bomb drill Tuesday, July 13. Cordell Jordan, media relations coordinator, works with Kim Holding, public relations specialist, to monitor the evacuation of the OCCC campus during the simulated bomb drill Tuesday, July 13. Cordell Jordan, media relations coordinator, talks with press members while waiting for the simulated bomb drill to begin. 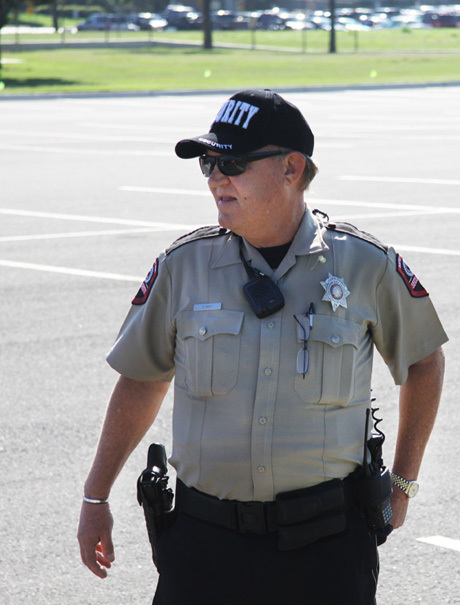 OCCC Safety and Security Officer Cliff Evans waits for the simulated bomb drill to begin in parking lot F on campus. Oklahoma City Fire Department Battalion Chief waits for the simulated bomb drill to begin in parking lot F Tuesday, July 13. 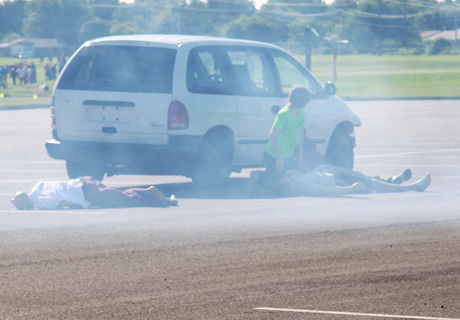 OCCC students pretend to be dazed after a mock car bomb explosion during a simulated bomb drill on the OCCC campus. 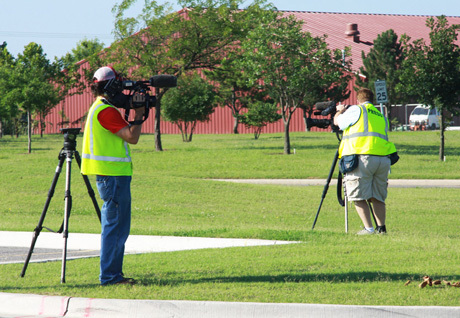 OCCC EMT students participate in a simulated bomb drill Tuesday, July 13 on campus in parking lot F.
Press members from KFOR Channel 4, KOCO Channel 5 and KWTV Channel 9 and the Oklahoman covered the simulated bomb drill Tuesday, July 13. 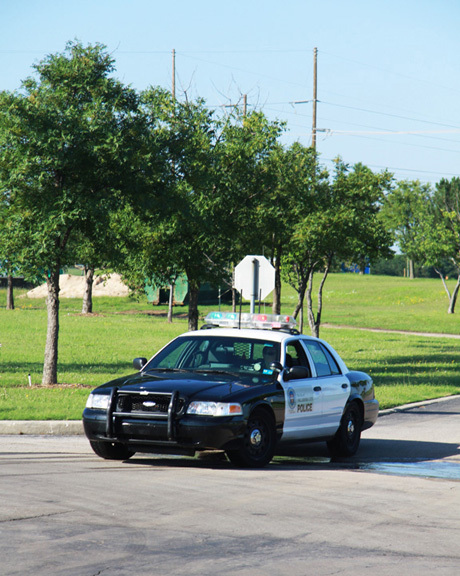 An Oklahoma City Police Department officer situates his patrol car to block traffic from nearing the scene of a mock bomb explosion. An Oklahoma City Police officer arrives on campus after receiving a call regarding a mock bomb explosion on campus at OCCC. OCCC held a full-scale simulated bomb drill Tuesday, July 13 on campus in Parking Lot F. The Oklahoma City Police Department and Bomb Squad, Oklahoma City Fire Department and Oklahoma City Emergency Medical Technicians participated in the drill alongside OCCC Safety and Security. 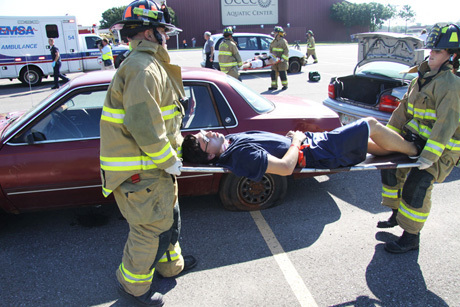 EMT students who participated in the OCCC simulated bomb drill on Tuesday, July 13 pretended to be injured inside cars, on the ground and on top of cars. 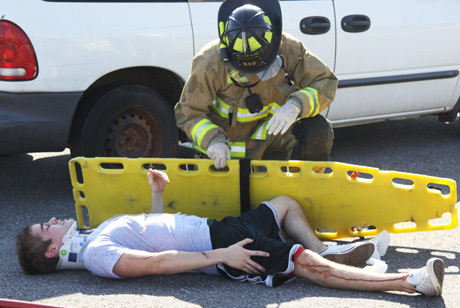 Here, a student is pretending to have receieved a mock leg injury while inside a car. 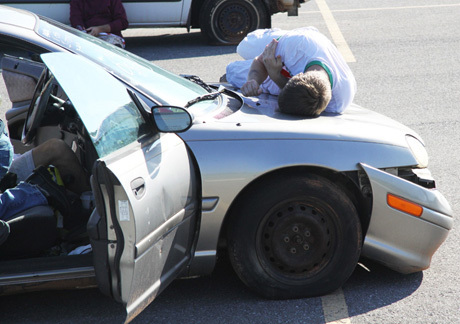 An EMT student pretends to be injured while atop a car after a mock bomb explosion. OCCC Emergency Medical Technician students and majors fake injuries during OCCC’s simulated bomb drill on Tuesday, July 13. 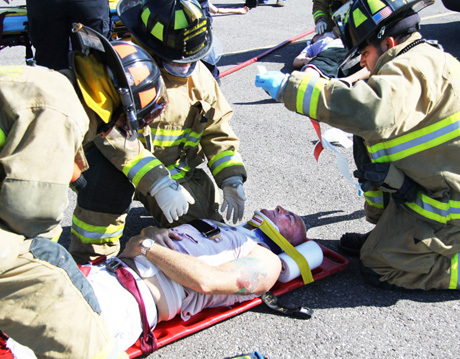 EMT majors who participated in the drill did so voluntarily while EMT students received extra credit. 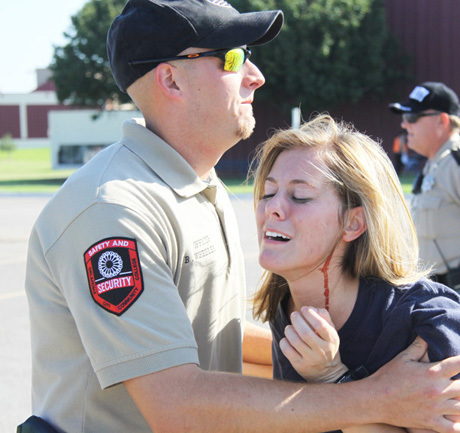 OCCC Safety and Security Officer Tanya Vroenen assists a mock injured EMT student while waiting for the arrival of OKC EMT and firefighters. 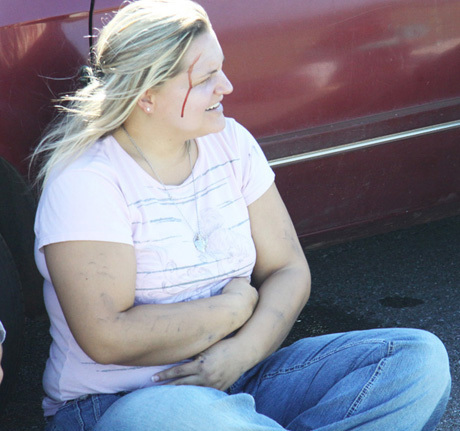 An OCCC EMT student plays the role of a student with a head and arm injury resulting from a mock car explosion caused by a mock bomb. 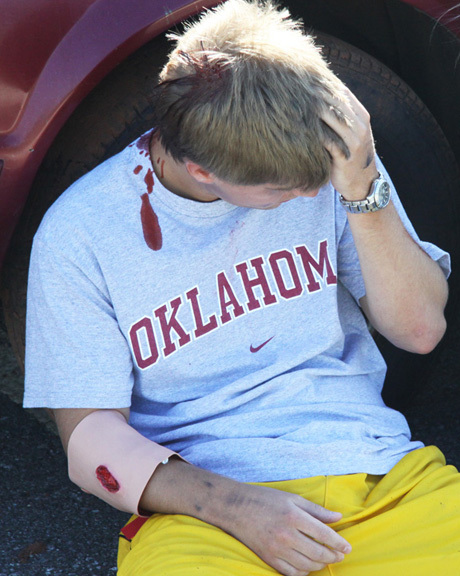 A mock injured OCCC Emergency Medical Technician student waits for the arrival of Oklahoma City EMT and firefighters. 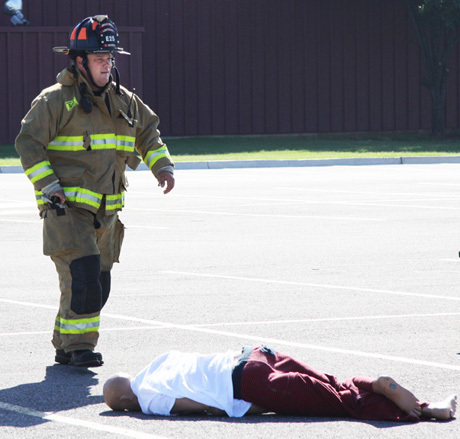 An OKC firefighters assess the site of the mock explosion as he approaches a dummy playing the role of a dead student. OKC firefighters move a mock unconscious student from the site of the mock explosion. 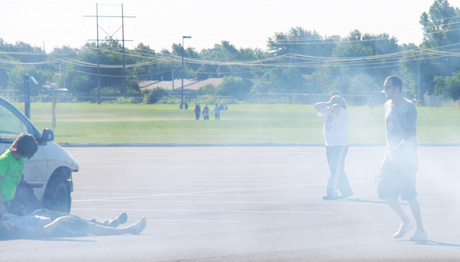 OCCC Emergency Medical Technician majors participated in the simulated bomb drill held on campus at OCCC in Parking Lot F on Tuesday, July 13. 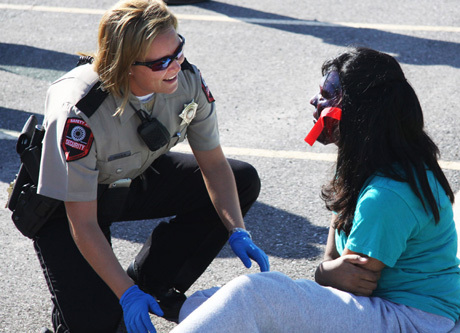 Student’s roles ranged from mock injured, to mock family and friends. OKC firefighters apply pressure to a mock wound caused by a mock car explosion during OCCC’s simulated bomb drill on July 13. Preston White, adjunct clinical instructor for OCCC, works alongside Oklahoma City Emergency Medical Technicians as they participate in a simluated bombing on campus. Bethany Barnes, a 15 year old high school student, played the part of an injured person. 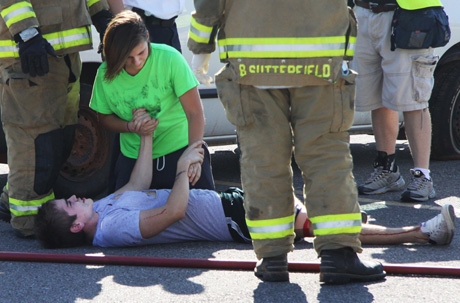 Firefighters work quickly to treat and identify a mock injured student during OCCC’s simulated bomb drill on July 13. 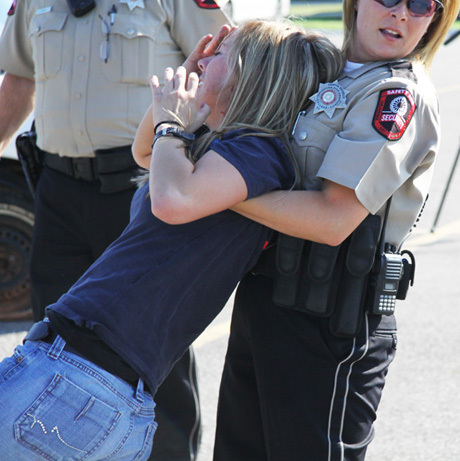 OCCC Safety and Security Officer Tanya Vroenen pulls Melissa Denison, premed major, away from the scene of the mock explosion. Denison’s role had her repeatedly trying to rush to her friend’s side thus interfering with firefighter’s and EMT’s ability to assist mock injured students. OKC firefighters transport a mock injured student who’s neck was was cut by flying shrapnel from an exploding car. OCCC Safety and Security Officer Kevin Wheeler assists student Melissa Denison, EMS major, during a simulated bombing July 13 on campus. 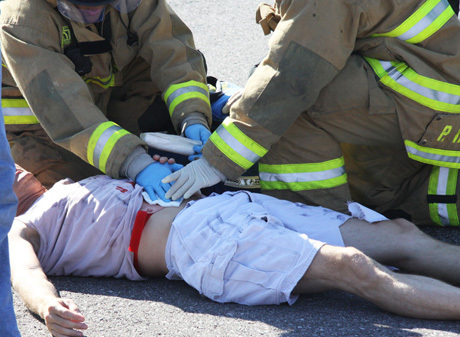 EMT student fakes unconsciousness resulting from a mock bomb explosion. 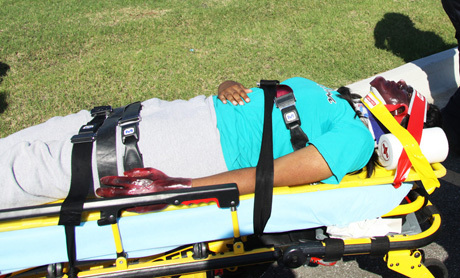 An OCCC EMT student in the process of being wheeled to the ambulance. She has placed fake skin over her face and hand to simulate third degree burns to her body. 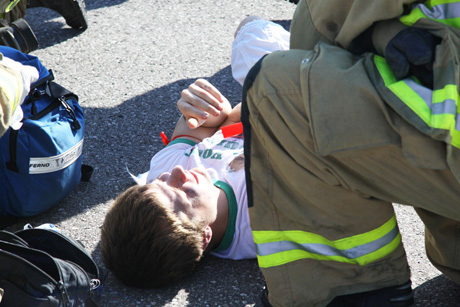 OKC firefighters work alongside OCCC Security to transport a mock injured student to the ambulance. 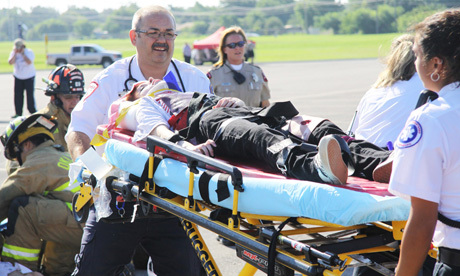 An Oklahoma City firefighter prepares a mock injured student for transportations via ambulance. 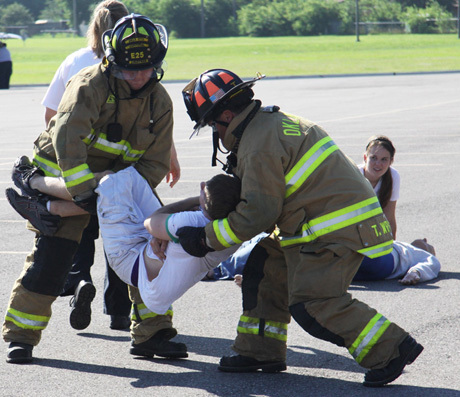 Oklahoma City firefighters work quickly to secure a student mock injured by a simulated car explosion. The red tape signifies this student has been critically injured and requires first priority in transportation and treatment. Oklahoma City firefighters assist John Bradley, premed major, as part of a bomb drill that took place on campus July 13. Oklahoma City police, bomb squad, firefighters and paramedics joined OCCC Security in the day-long drill. 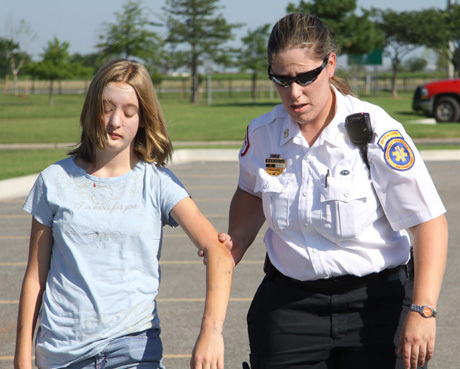 An EMT moves a mock injured teenager to safety. OCCC also brought in some younger relatives of adjuncts and students to simulate pediatric injuries. Students were forced outside as area police, firemen and the Oklahoma City bomb squad converged on campus to participate in a college-wide bomb drill Tuesday, July 13. The simulated bomb threat began at 9:08 a.m. when a mock bomb exploded on the south side of the college in parking lot F. The drill lasted throughout most of the afternoon. During the event, OCPD bomb squad personnel and OCCC security guards worked together to capture the pretend bomber who fled the scene. The OCPD bomb squad also was kept busy dealing with a second bomb in a cooler left at the site of the mock explosion. Students also assisted in the event. 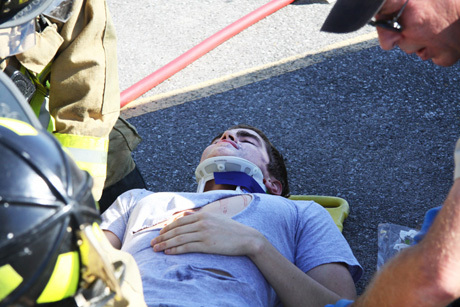 Twelve emergency medical students volunteered to simulate injuries created by a car explosion. Five other students played the roles of bystanders, said Cordell Jordan, Media Relations coordinator. Mock injuries, ranging from ruptured eardrums, shrapnel wounds and broken bones, were rated with a color code system by EMTs and firefighters, she said. This was the first time the college could test its new security procedures implemented after the Feb. 26 campus shooter incident, which include public address speakers mounted outside on some of the campus buildings, Jordan said. Although the drill had everyone in the buildings evacuating outside, Jordan said in a real situation like the one performed Tuesday, the college would actually be locked down. Steven Warren, EMT student, said he enjoyed participating in the simulation.“I’m glad to be a part of something that helps our college and public service members become better at their jobs,” he said.